Companies that don't take advantage of content accelerators when deploying SAP Solution Manager software are missing out, writes Tony de Thomasis. Editor's note: The following article is the second in a three-part series on building a roadmap for deploying SAP Solution Manager. Part one lays out a common adoption sequence for companies to follow. Part two lays out creating a Business Blueprint structure and taking advantage of the Business Process Repository. Part three examines the use of accelerators to speed deployment. Using the Engineering Services (ESRV) Roadmap within SAP Solution Manager can help guide you through the best practices and content accelerators for deploying Solution Manager modules. To get to the Roadmap, follow menu path Environment > Roadmap (or use transaction RMMAIN). Using SAP Solution Documentation as an example, select Pilot Implementation Solution Documentation,under the Implementation title, to access the folder view for the roadmap. This pilot implementation information contains links to reference documents, sample project plans and other current content to help deploy the Solution Documentation module (Figure 2). Highlight a document of interest and then click the eyeglass icon to navigate to the URL link in the SAP Service Marketplace. To print the roadmap with all the structure documents and links, follow menu path Roadmap > Print > Structure with Documents. As with the Business Process Repository, the SAP Solution Manager ESRV and Run SAP Like a Factory (RSLaF) Roadmaps are continuously updated via the ST-ICO supportpackages. When deploying SAP Solution Manager modules, try to use the latest roadmaps to ensure that the latest accelerators and how-to guides are available to you. 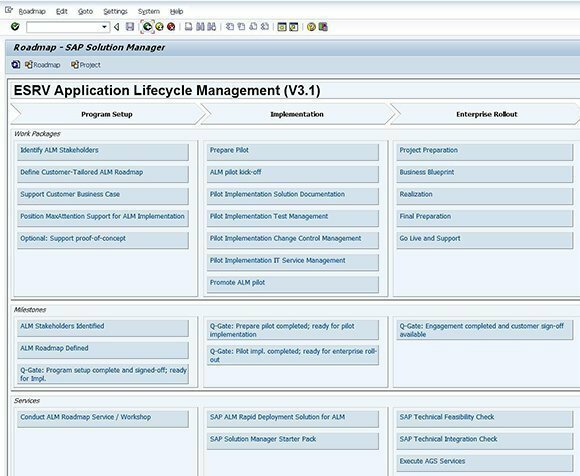 Now that you have built an application lifecycle management (ALM) Business Blueprint for the Solution Documentation module, you can extend it and use it to deploy other SAP Solution Manager ALM or RSLaF modules. Your next module might be Test Management, Change Management or Service Management. How about End User Experience Monitoring with a mobile app? Whichever module you choose, there's a current SAP Solution Manager ESRV roadmap designed to guide you through the process.